Or Yehuda, Israel, November 13, 2013 – Formula Systems (1985) Ltd. (NASDAQ: FORTY) a leading provider of software consulting services, computer-based business solutions, and proprietary software products, today announced its results for the third quarter of 2013. Revenues for the third quarter ended September 30, 2013, increased 8% to $197.3 million compared to $182.0 million in the same period of 2012. Operating income for the third quarter ended September 30, 2013, increased 5% to $14.8 million, compared to $14.0 million in the same period of 2012; Non-GAAP operating income for the third quarter ended September 30, 2013, decreased 2% to $17.5 million, compared to $17.9 million in the same period of 2012. Operating income was negatively impacted by seasonality, with the early timing of holidays compared to 2012. Net income for the third quarter ended September 30, 2013, increased 10% to $5.2 million (or $0.36 per fully diluted share) compared to $4.7 million (or $0.33 per fully diluted share) in the same period of 2012. Non-GAAP net income for the third quarter ended September 30, 2013, increased 10% to $7.4 million compared to $6.7 million in the same period of 2012. Revenues for the nine-month period ended September 30, 2013, increased 7% to $587.2 million compared to $546.5 million in the same period of 2012. Operating income for the nine-month period ended September 30, 2013, increased 4% to $43.4 million compared to $41.9 million in the same period of 2012; Non-GAAP operating income for the nine-month period ended September 30, 2013, decreased 3% to $52.0 million compared to $53.5 million in the same period of 2012. 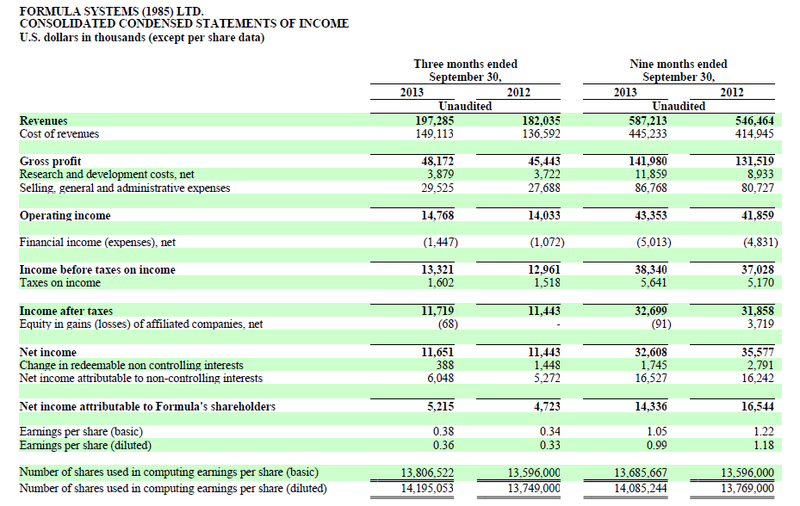 Net income for the nine-month period ended September 30, 2013, decreased 13% to $14.3 million (or $0.99 per fully diluted share) compared to $16.5 million (or $1.18 per fully diluted share) in the same period of 2012; Net income in 2012 included a net gain of $3.4 million resulting from the remeasurement of the Company’s investments, attributable to regaining a controlling interest in Sapiens. 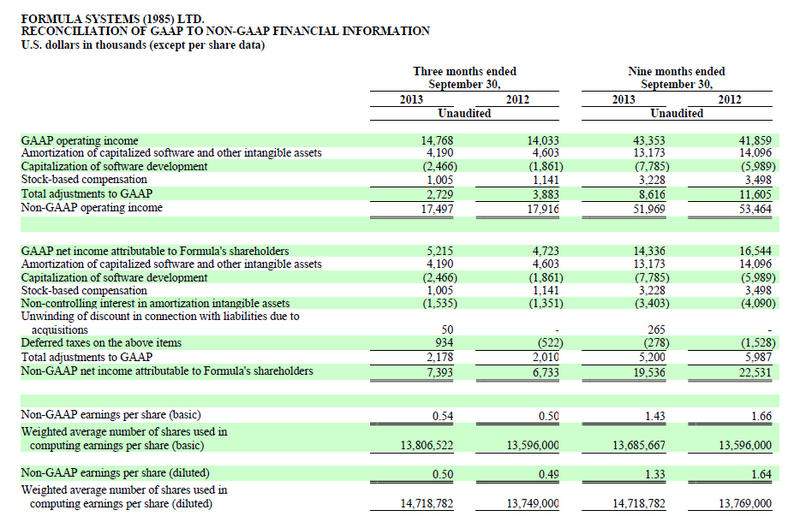 Non-GAAP net income for the nine-month period ended September 30, 2013, decreased 13% to $19.5 million compared to $22.5 million in the same period of 2012. Formula’s consolidated cash and short-term and long-term investments in marketable securities totaled approximately $126.0 million, as of September 30, 2013. 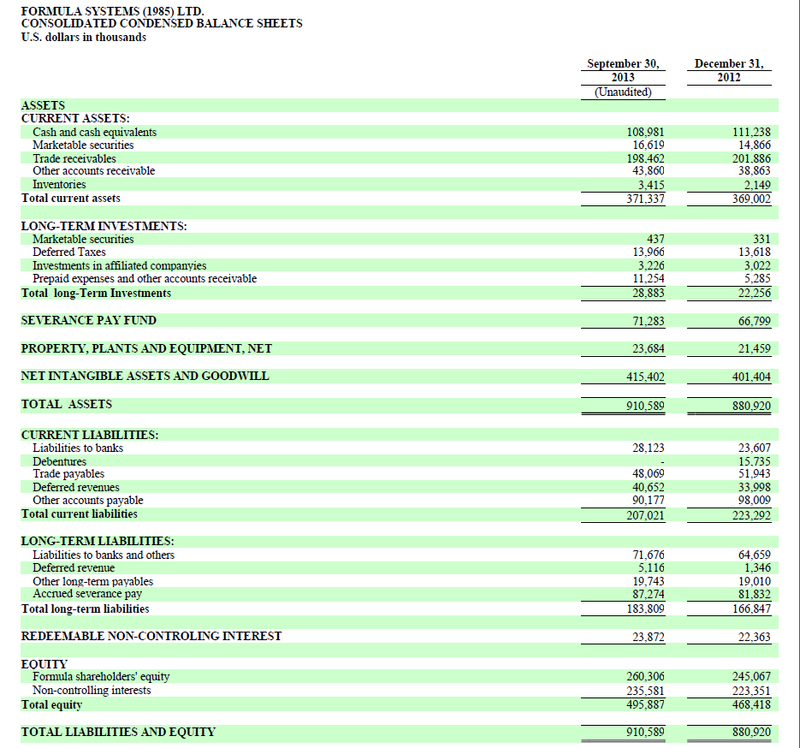 Total equity on September 30, 2013 was $495.9 million, representing 54% of the total balance sheet. Related tax effect of the above items.